I hope you all had a wonderful holiday and New Year. I’m still picking up and cleaning after all the out of town guests we had at the house and recovering from too much food and fun. But I’ve been knitting right along and having a great time with baby patterns. This is a cute little sweater knit from a Bergere de France pattern book that caught my eye. The pattern is written in English but there were all kinds of amusing and maddening techniques that we American knitters don’t really do. I love the end result, though, and will be knitting this again with some modifications. First of all, this sweater is knitted flat and requires seaming, which I don’t really like to do. But I liked the sweater so much I did it anyway. One of the odd things about the pattern is that they have you knit the neckband separately, leave the stitches on a separate needle and then graft it on. That seemed ridiculous, so I just picked up the stitches around the neck and knitted the neckband. The other odd thing was the creation of the buttonholes. I’ve never encountered this – they had you knit the sweater with no yo’s for buttonholes. 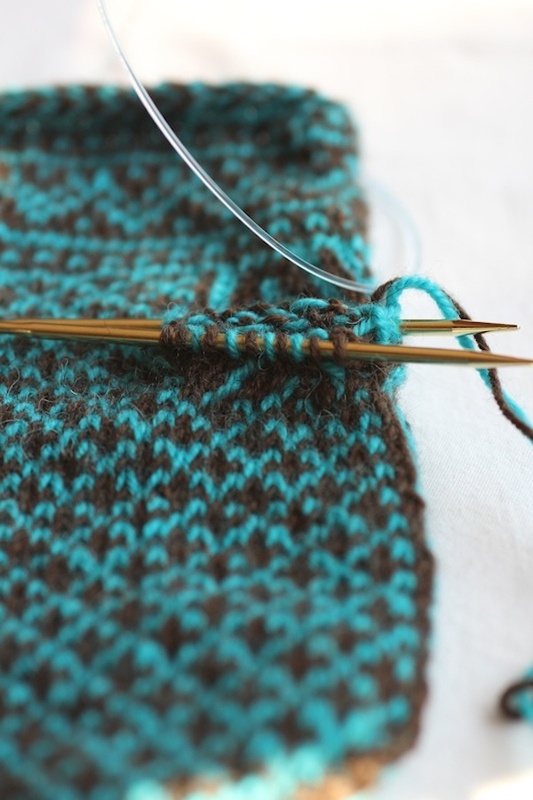 After the sweater is done, you create buttonholes by lifting a stitch above and below where you want the hole to be and sewing those stitches aside. What? But I gave it a go and hated it. Never doing that again. The buttonholes it created weren’t very good and it was an enormous hassle, with having to weave in yarn ends all around the buttonholes. Yikes. I guess this is a typical French technique, but I’m sure glad we don’t do that here. Another odd thing – the pattern has four sizes – newborn, 1 month, 3 months and 6 months. Isn’t that weird? Usually patterns are, for instance, 0-3 months, 3-6 months, 9-12 months, etc. Something like that. So I wanted to knit a 12 month size, but there was no 12 months size. My solution was to pick a heavier weight yarn (Cascade 220 Superwash Aran) and knit on bigger needles (#9). I figured I would end up with about a 12 months size. Nope. I ended up with about a 2 or 3 year size! Especially after I blocked the sweater, and the yarn relaxed like crazy. It became huge. So it’s really not a baby sweater anymore. 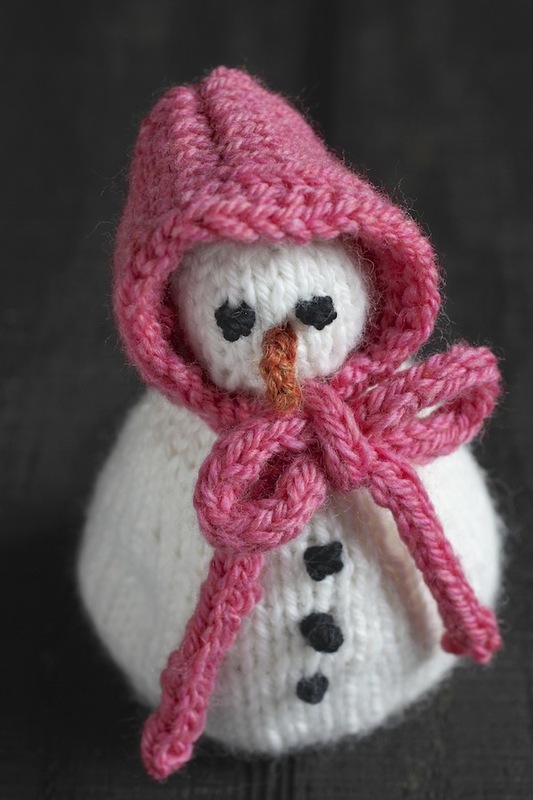 So I will be knitting this again, using DK and smaller needles. I loved the sweater, though. The cables were just a sweet touch and I’m a sucker for garter stitch hem and cuffs. Looking forward to knitting it again. 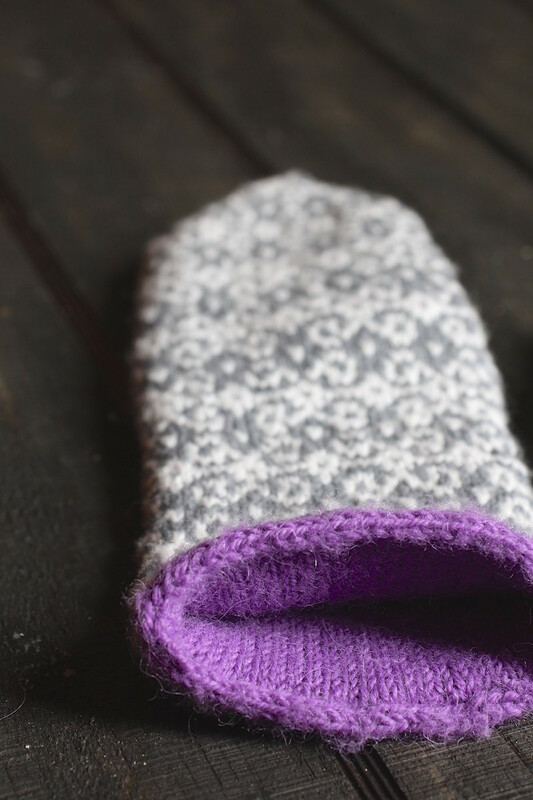 I do love a good mitten pattern and this new one I found might be my favorite yet. 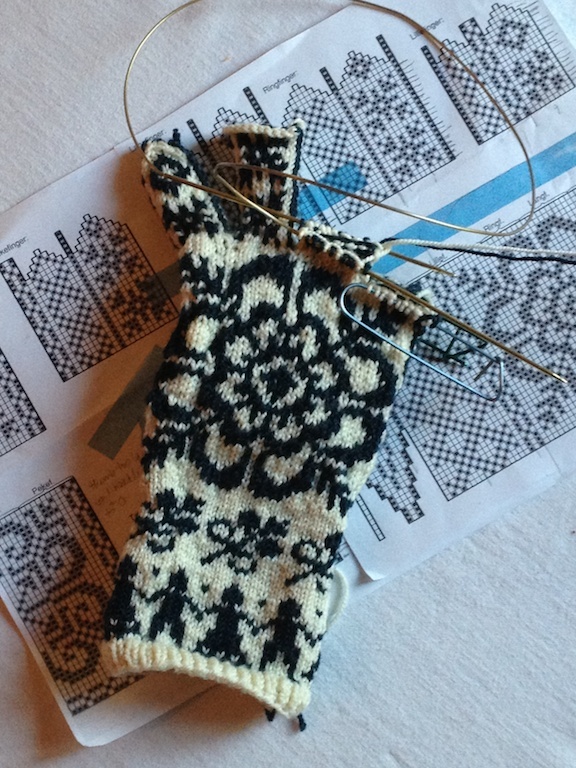 The Northman Mitten is right up there, though. 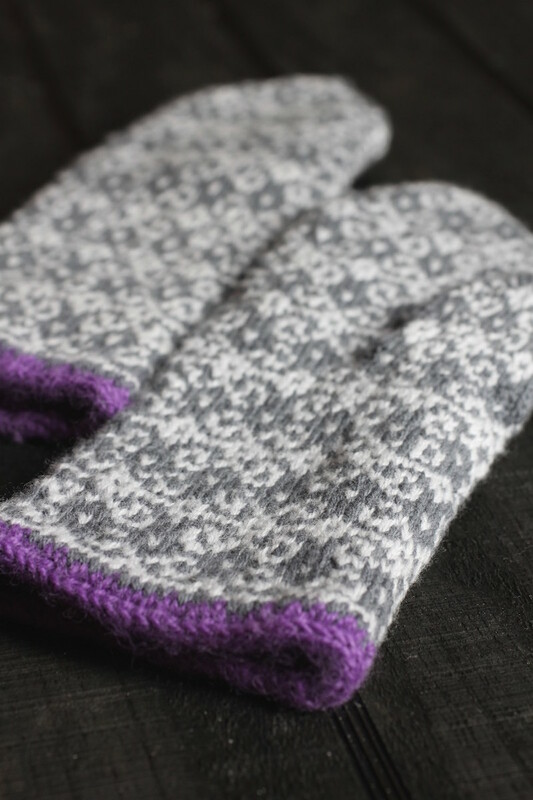 There’s a couple of things I look for in a good mitten pattern: it has to have a decent thumb (either an afterthought thumb or a thumb with a gusset) and it has to be a two color pattern. This pattern has both and it also has a lining, which is really nice. And it was a really fun knit. This pattern is from Elinor Brown, a knitting pattern designer who I was always in awe of because she designed all these wonderful patterns and did all this knitting while attending medical school. 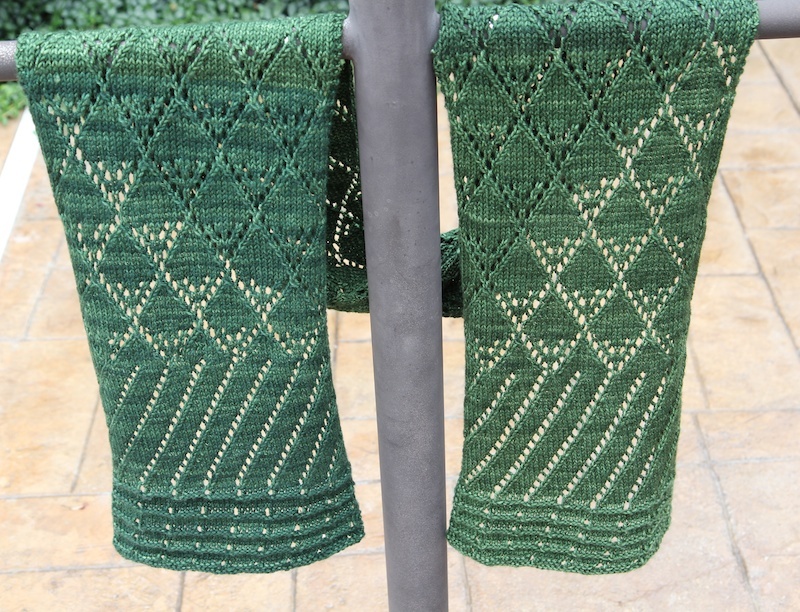 The pattern gives three sizes for the mittens. I knit the Medium and I thought they seemed just right for the average woman’s hands. 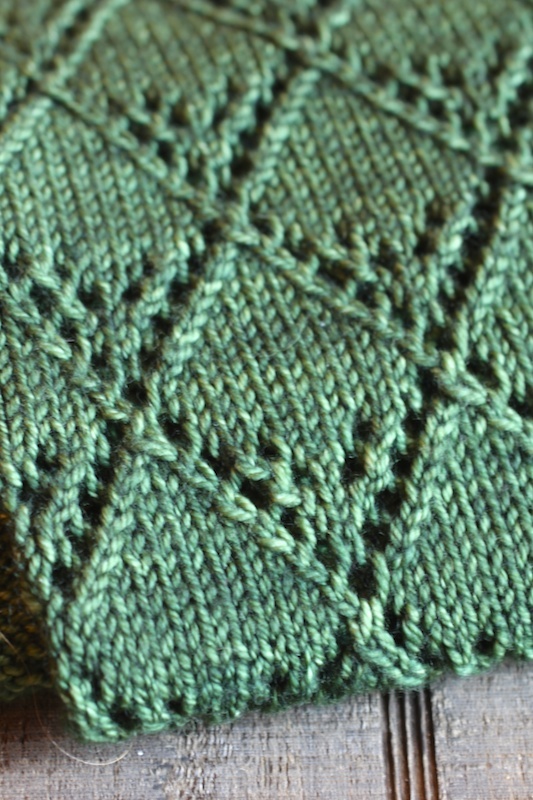 I chose to use Quince Chickadee for the outer mitten yarn so that the pattern had a lot of stitch definition. It’s a 100% wool yarn. 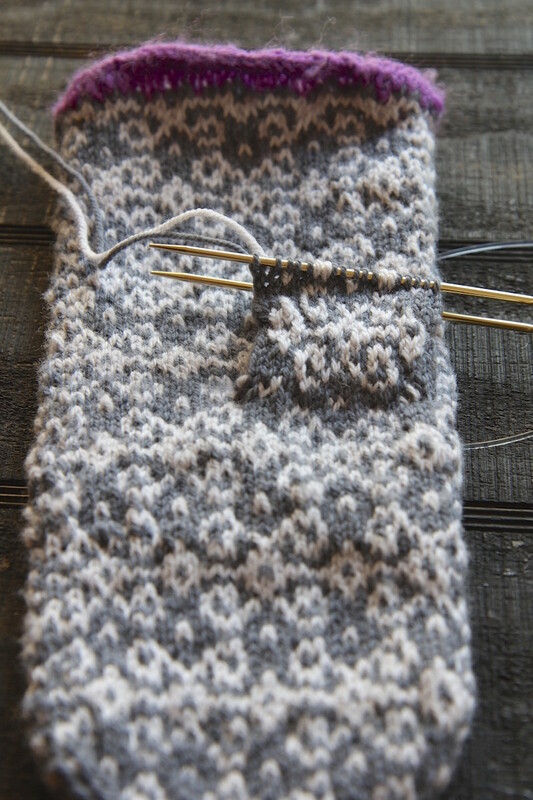 Sometimes, in the past, when I have used a wool and alpaca blend for an outer mitten, the alpaca fuzzes up a little too much and the pattern becomes a little blurry. But I like the warmth of alpaca so I used that for the inner mitten. 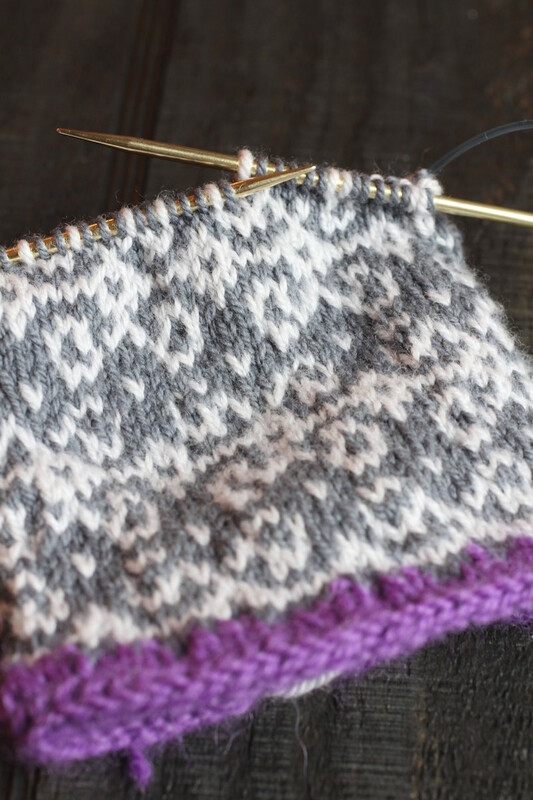 Two color knitting is so fun and it’s addictive to watch your pattern coming off the needles. When I knit in two colors, I hold one yarn (the contrast color) in the left hand and knit Continental with that and I hold the other yarn (the background color) in the right hand and knit English on that side. It took some practice to learn, but it’s natural for me now and very fast. 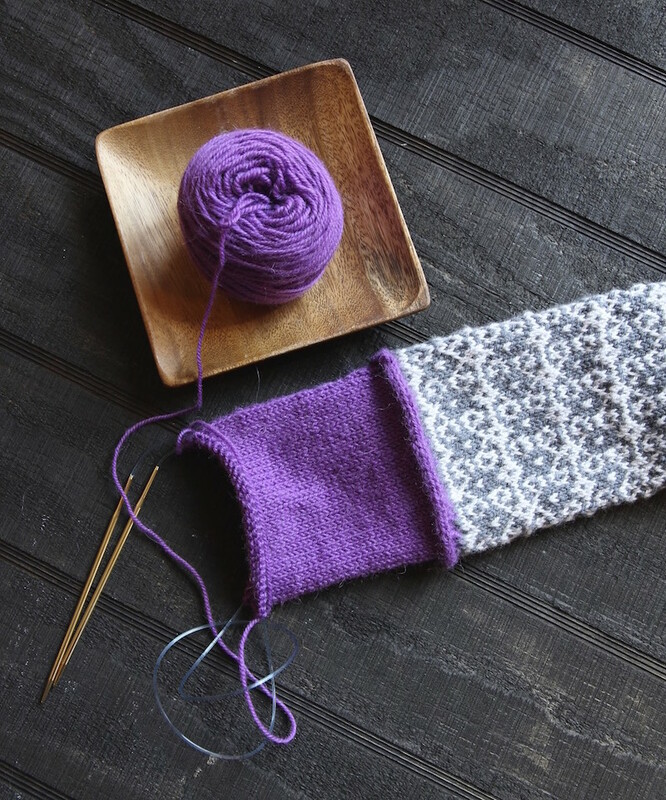 if you hold the contrast yarn in the left hand, it becomes dominant in the finished knitting. The background color is held in the right hand, and stays in the background. 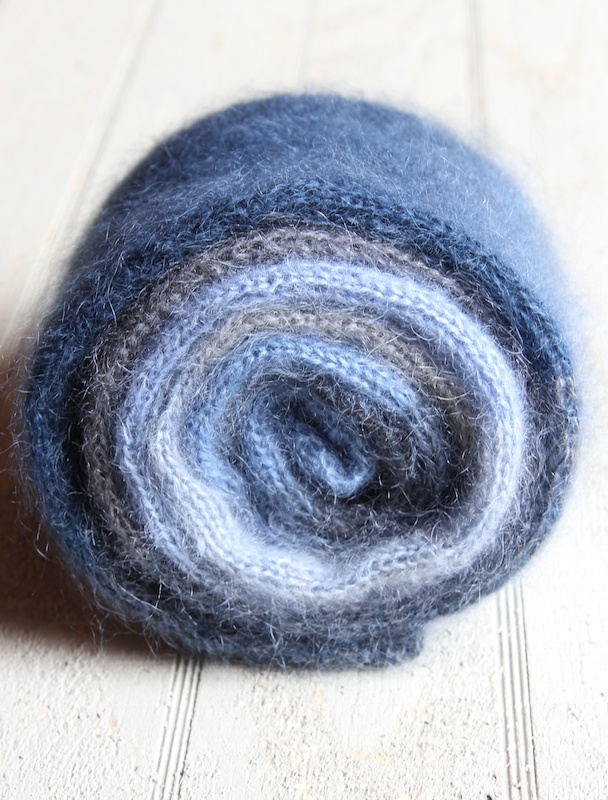 I knit all my projects in the round on circular needles using Magic Loop instead of double points. It makes it very easy to try on the project and assess sizing as you go. Plus I hate all the double points sticking out and having to work around them. And it makes knitting the thumbs very easy. The only thing I did not totally love on this pattern was the i-cord cast on. The result just wasn’t worth the aggravation. 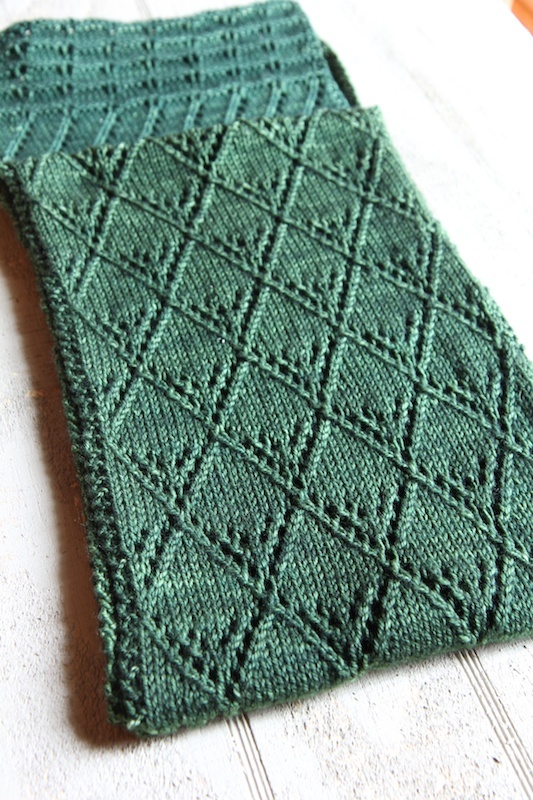 If I knit another pair of these (and I will) I’m going to do a different kind of cuff – maybe a picot edge. I think one of the nicest yarn shops I have ever visited is the Yarn Garden in Charlotte, Michigan. I was in there a couple of years ago and was so impressed with this shop. I wish I had taken a picture of the interior. Old fashioned downtown shop with high ceilings, brick interior . 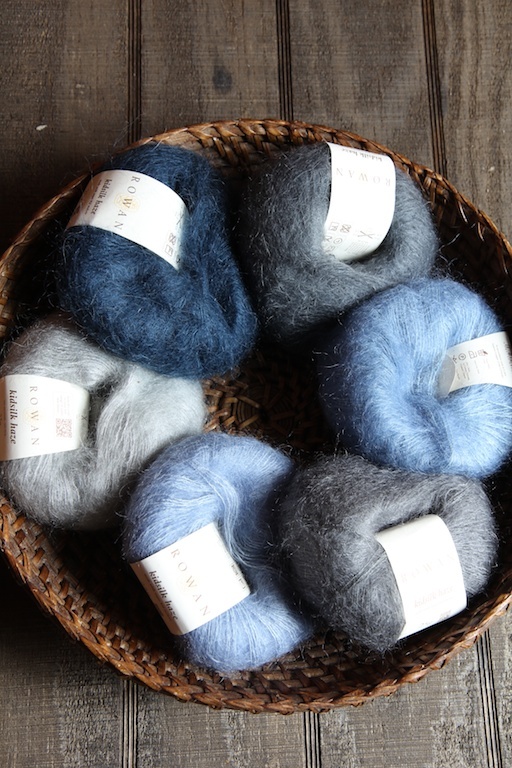 . . just a really welcoming space with lots of quality yarns. I loved this place. And on one of the display shelves sat the cutest little knitted winter family of characters. I immediately bought the pattern and finally got around to knitting a few of the little guys. 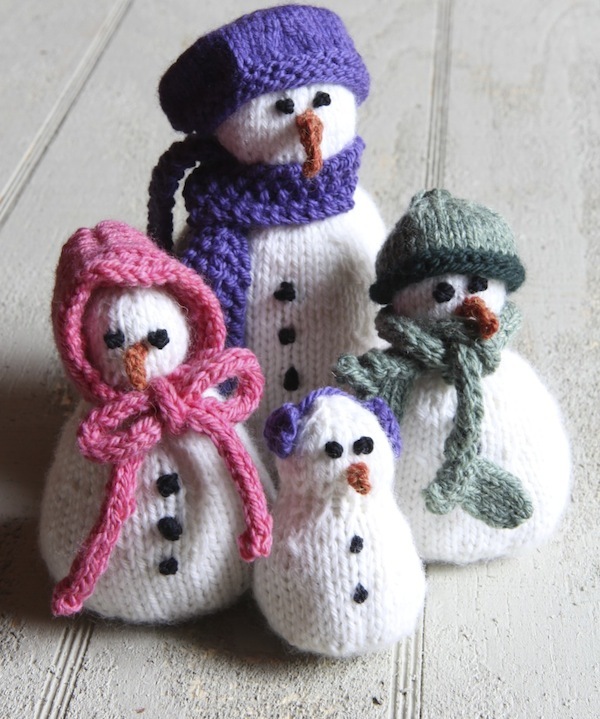 These tiny people are quick to knit up. You stuff the bottoms with dried beans for weight and then add poly fill for the rest. 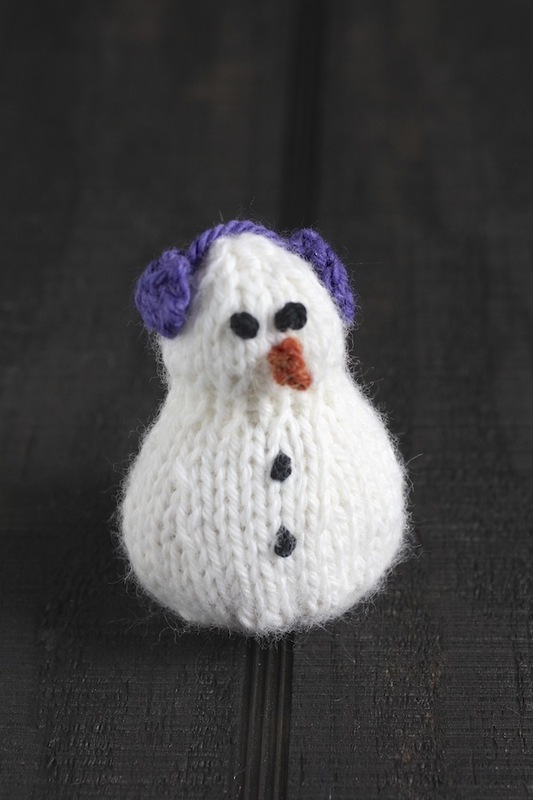 The pattern is easy for just about everything except the little baby’s earmuffs – I never did understand the directions for those and so I just improvised. Other than that, there were no troubles with the pattern and I had so much fun knitting them. 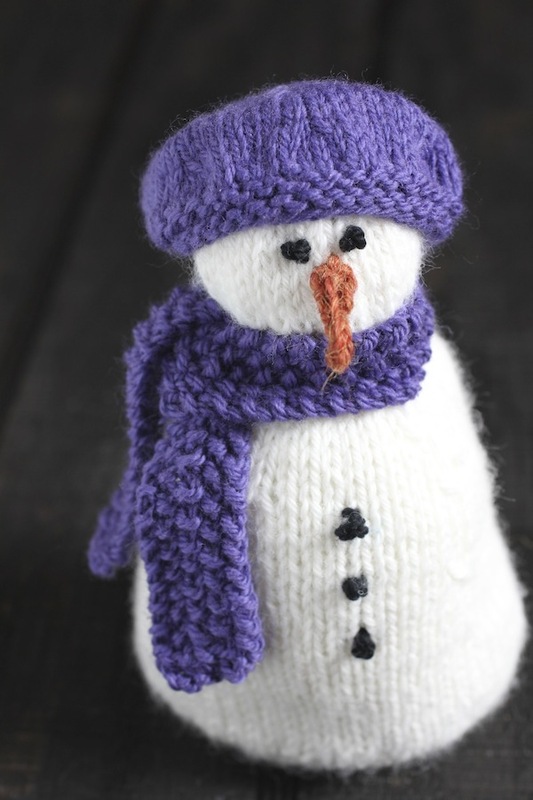 This is a great pattern in which to use up scraps of yarn. All the little accessories do not take up much yarn. I knitted these in worsted weight yarns. 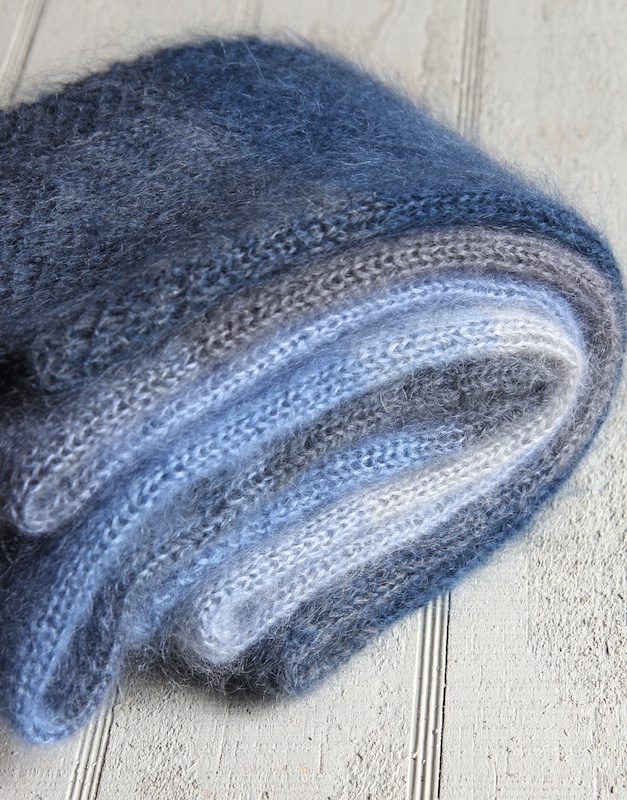 Have you ever knit anything with Rowan Kidsilk Haze? 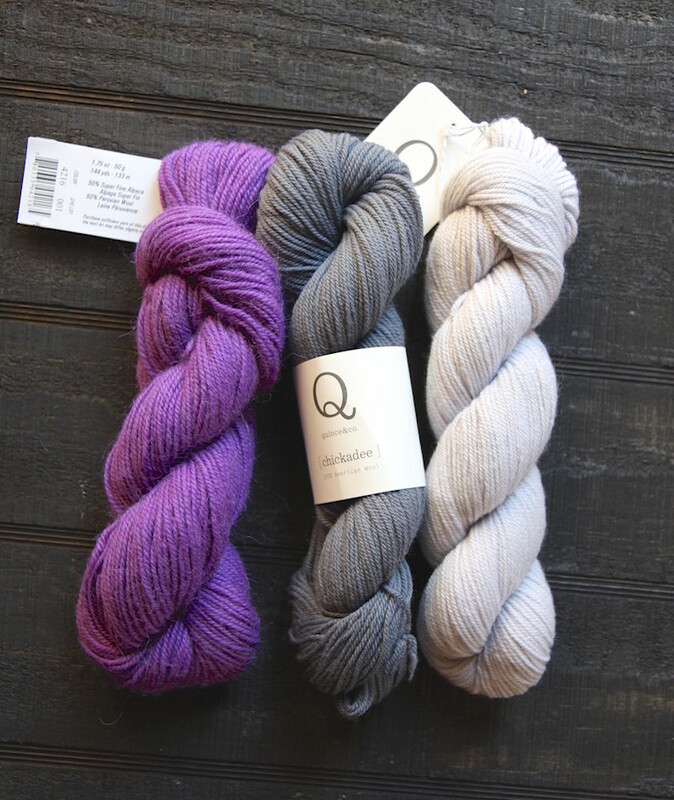 If you have, you know how gorgeous this Italian yarn is. 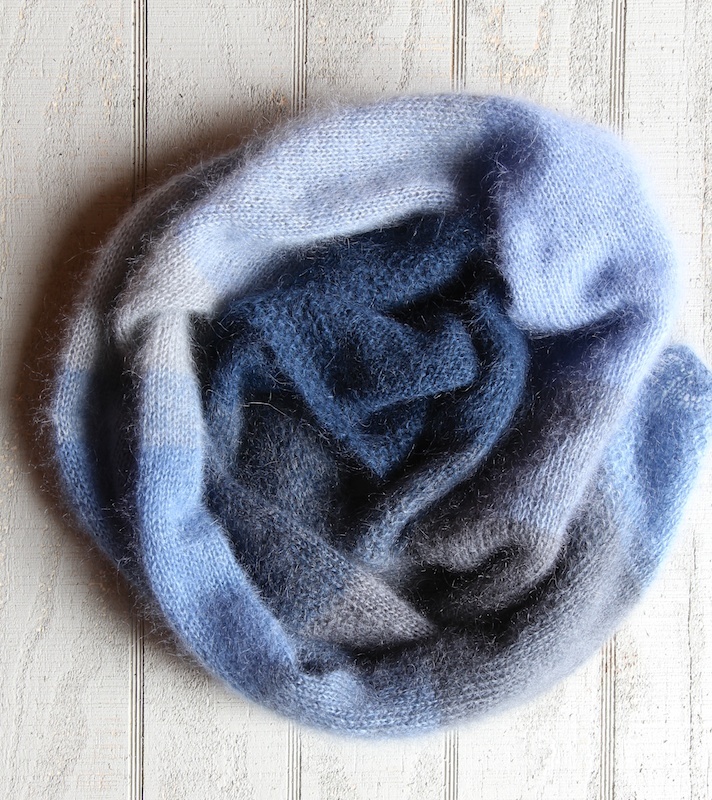 It is a lace weight blend of mohair and silk that is light as a feather. It is an expensive yarn, but it’s very special. Whatever you make from it is very warm and has fantastic drape. 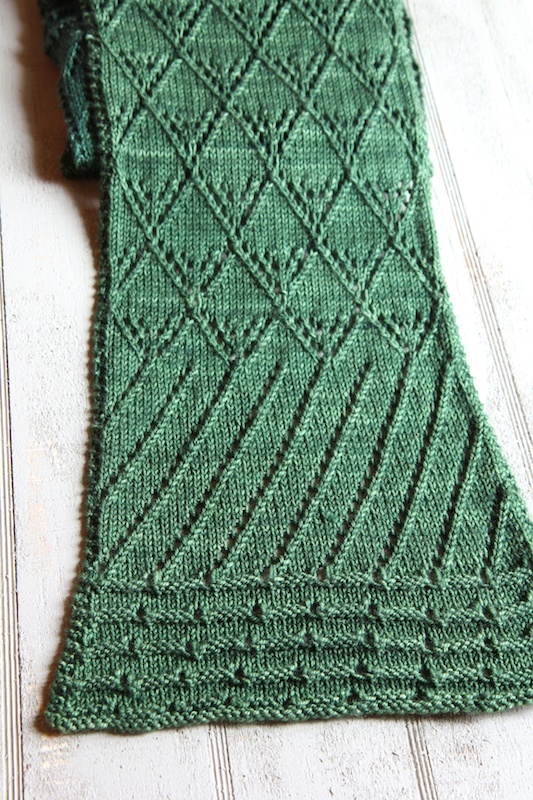 This pattern is, once again, from one of my favorite pattern resources – Churchmouse Yarns and Tea. The pattern calls for four solid colors, but I used six because I wanted a much longer scarf. The yarn is to be held double. The pattern has you knit one of the solid colors for a big block and then cut one yarn and add in one yarn of another color. Now you are knitting with two colors at once and you get a great new color. 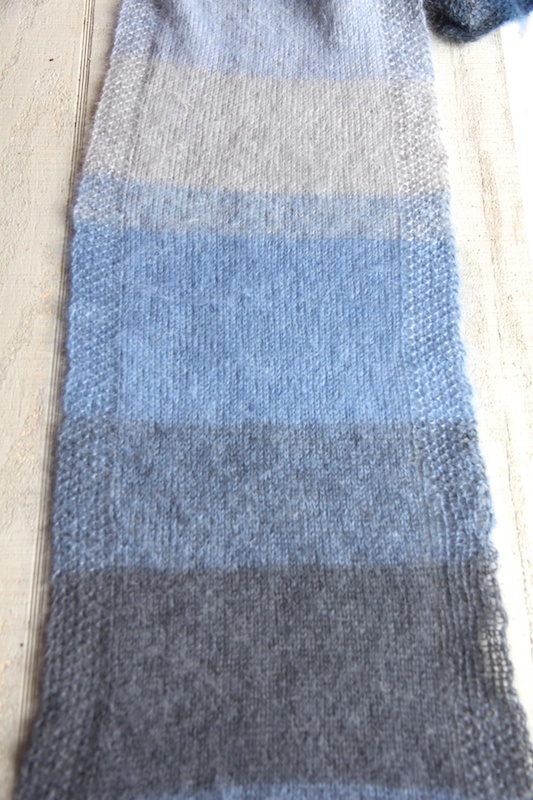 Then you cut the first color and add another end of the second color and knit with just that color. It’s fun to see the colors that two different skeins produce together. I did not follow the pattern regarding how long to knit in one color – I just knit until I felt like switching colors. The scarf is all stockinette stitch, except for a 7 stitch border on each side done in seed stitch, to keep it from curling. It’s very effective. 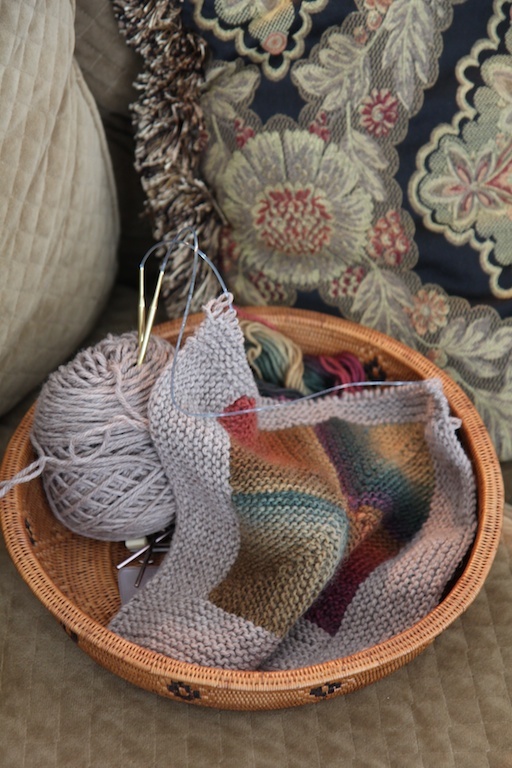 All that stockinette makes for easy knitting while you watch TV. The scarf lies very nicely. I damp blocked instead of wet blocked it. I figured it would be way too heavy to handle if I wet blocked it. I just threw two towels in the washer on rinse and spin and then wrapped the scarf up in there overnight and then pinned and blocked it the next day, as the pattern suggested. It worked really well. The scarf ended up being 82″ x 13″ after blocking, a really nice length. I did not quite use completely all six skeins. I’m definitely going to knitting more of this pattern, it’s so great. I can see all kinds of terrific color combinations. 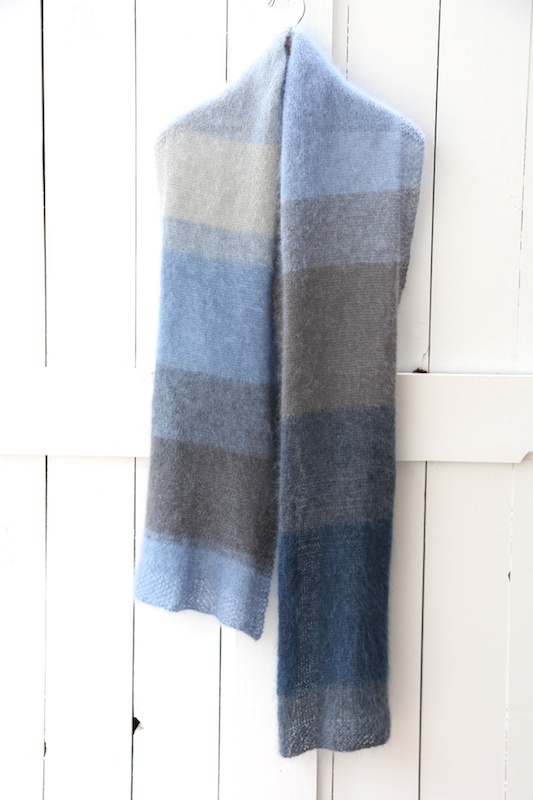 Kidsilk Haze is about $15 a skein, so it’s ends up being about $90 to knit one of these scarves in this length. 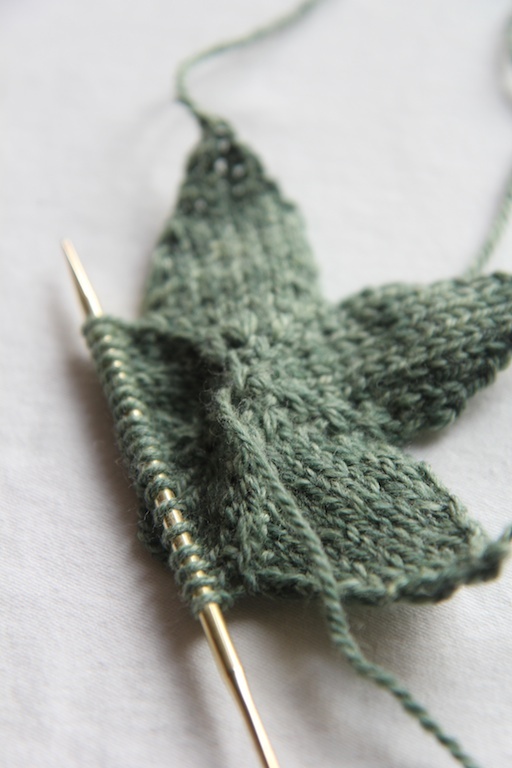 Often, I have two knitting projects going at the same time – one that’s so simple I don’t have to really follow a chart and can do it while I’m watching TV and one that’s complicated and requires attention. This pattern is one of those that requires your full attention. It’s lace knitting and a whole lot of fun, actually. I loved this pattern and the design and it was thoroughly enjoyable to knit (although I had to start it three times because of mistakes before I got really going with it). 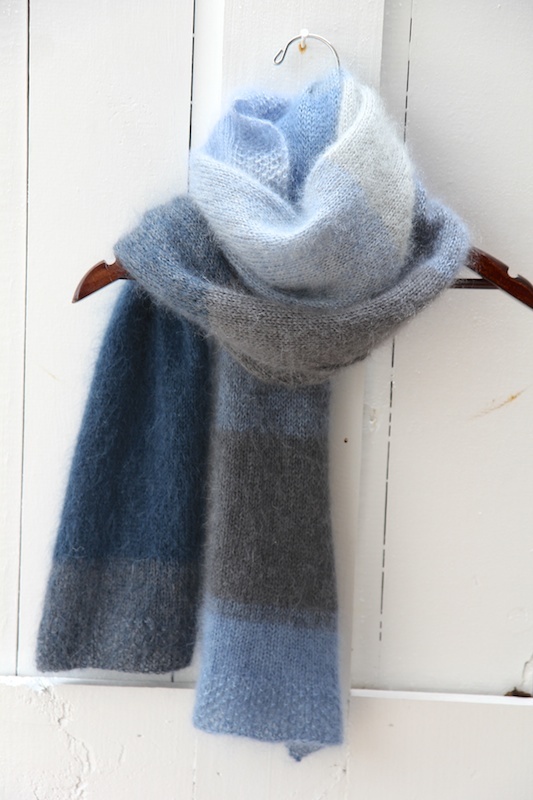 It’s knitted in two halves and then grafted together. Second half went much smoother. 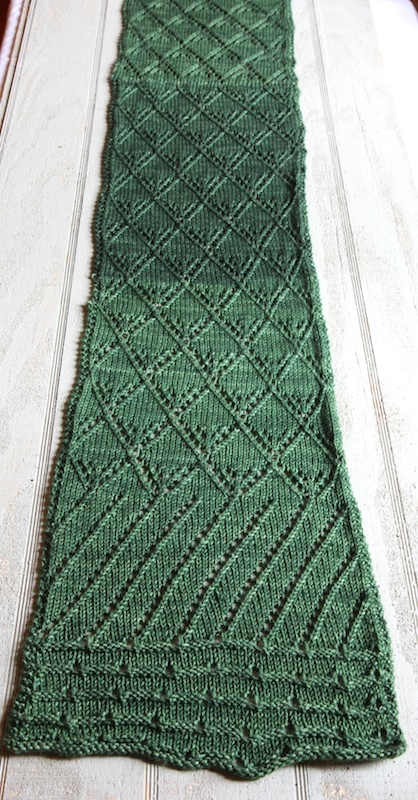 Although I loved doing this pattern, I’m was not super happy with the outcome of this scarf for two reasons – no matter how much I blocked this scarf, the sides keep curling. Badly. If you look at the opening photo in this post, you can really see it. It really takes away from the finished look, because I don’t really care for skinny scarves. I blocked this baby twice and even steam blocked it with an iron, but the curling stayed despite the fact that the designer put purls on the edging to counteract the curl. So I’m not sure if it was just me or what. Also, I have used Madelinetosh yarn for lots of projects. I realize it is a hand dyed yarn, where there will be slight differences in the skeins. 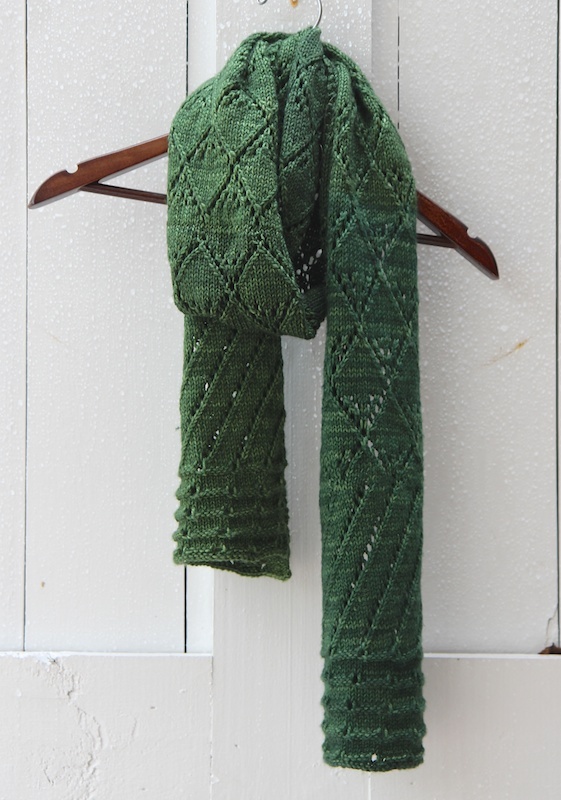 And Moorland is one of my favorite colorways and I have used it before for my awesome Stockholm Scarf and my Guernsey Wrap. 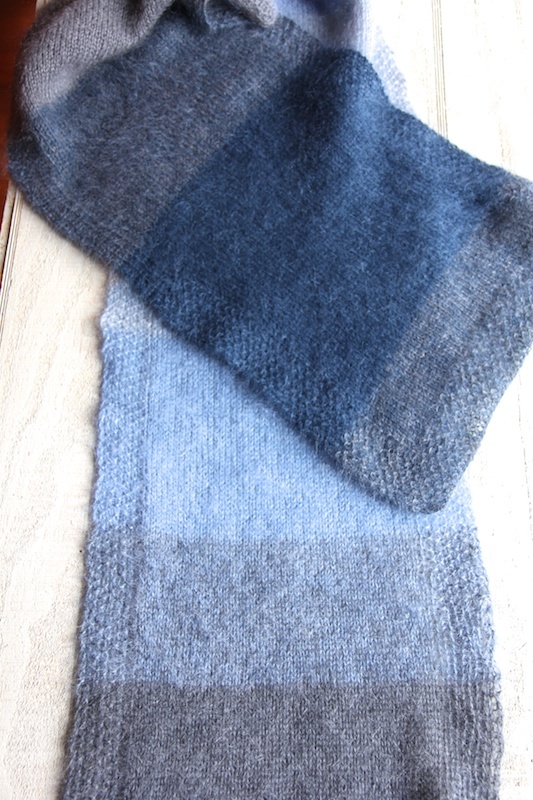 However, this time the difference in the skeins was amazing – you can see it in the photo above. The yarn was all purchased at the same time. I was really disappointed with this. It just has never happened before. Oh, well. I guess when it’s all wrapped around your neck you won’t really notice it too much. The Tosh is still super soft and squishy. I love it. I’ve knit for 24 years now and in that time, I’ve been a very busy person. I’ve raised three children, worked full time, worked part time, and then finally stayed at home and now I write a food blog. But in all that time, I’ve always found time to knit. Always. And when people see my knitting projects, the one remark they always make is, “Gee, I wish I had time to knit”. But they do. They just don’t know it. 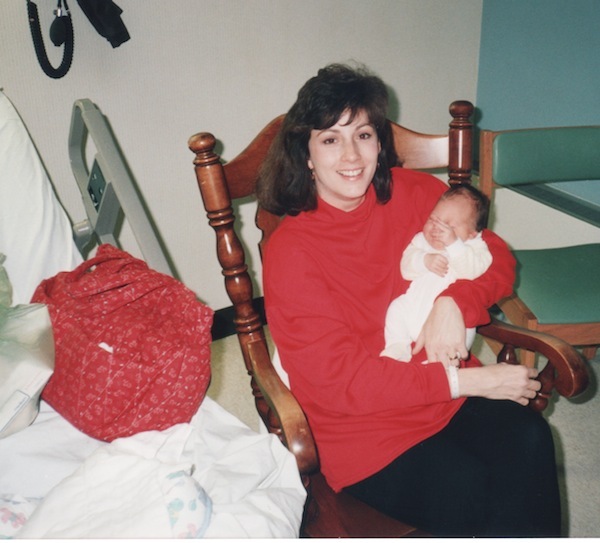 Here is a photo of me 23 years ago with my second child, Nick, the day I am leaving the hospital. Note the item on the bed as I am waiting to go home. My knitting bag. Yes, I knit in the hospital after having him. I always take my knitting bag with me if I think I might get the chance to get in a few rows. That is how you get a project done. It may take a while, but you get it done. I think the biggest problem with people thinking that they don’t have time to knit is that they think they have to have an actual block of time to just sit down and knit. Well, I can tell you that I almost never do that. I knit when I’m watching TV or a movie, when I’m riding in the car, when I’m on a plane or maybe when I’m sitting and chatting with someone. I almost never sit down and just knit. I might listen to an audiobook as I knit or talk on the phone. I take my knitting sometimes if I know I’m going to be waiting in the doctor’s office. If you watch TV in the evening and knit for just 20 minutes every night while you watch, you will get something done. 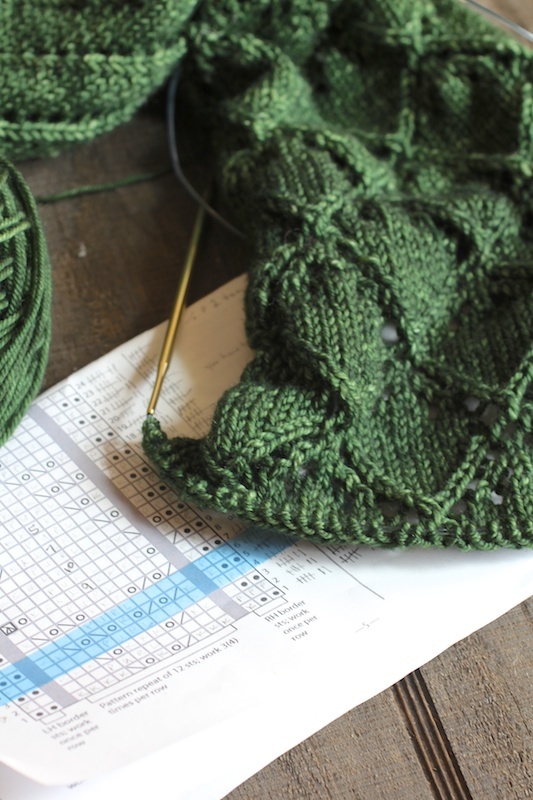 I usually have two projects going at the same time – one that maybe is a little more complicated, that requires me to follow a chart and so demands that I have to focus a little and a second project that is just “idiot” knitting and doesn’t require that I follow a pattern. Then I can decide which one I can work on in any situation. I hope for 2014 you will be inspired and start a project with the commitment that you are going to pick it up whenever you can. I have my knitting sitting in a basket on the sofa so that it’s very accessible. I have a knitting bag that I can just throw it into and take it with me if I need to. Also, if you haven’t joined Ravelry yet, do so right away. 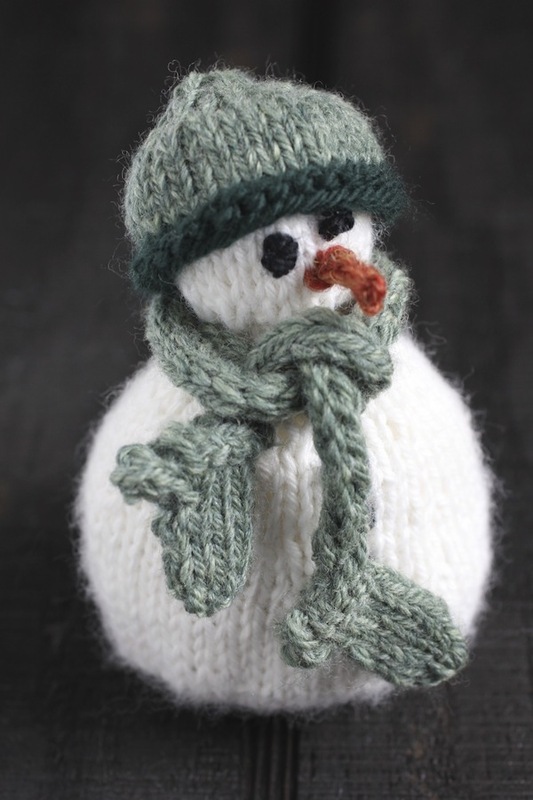 It’s a community of knitters worldwide who share projects, thoughts and tips about knitting. It’s a constant source of inspiration for me and might be for you, too. Reading good knitting blogs like Yarn Harlot and Little Cotton Rabbits helps, too. Now go forth and knit! 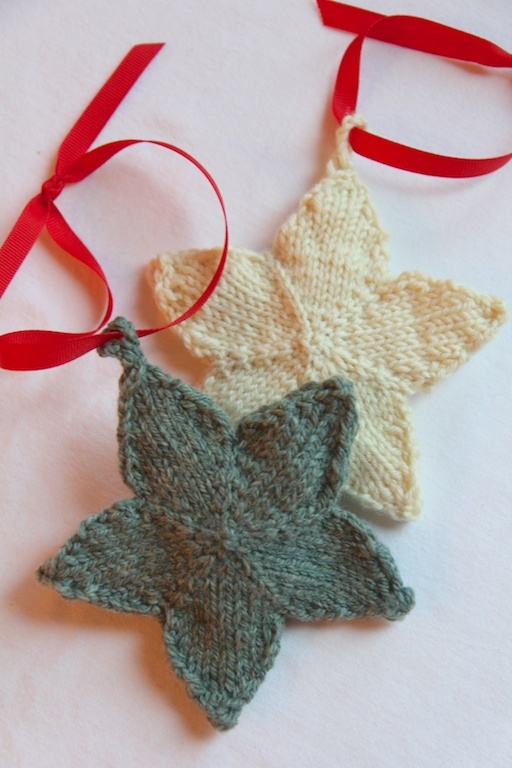 I’m knitting these cute stars for Christmas and they are so much fun. They are a free downloadable pattern from Webs. I can see making these in all kinds of colors. The pattern calls for sport weight yarn, but I knitted them in worsted. It doesn’t really matter for these – it just depends on how big you want them. These stars use a really interesting construction. You cast on 5 stitches and join in the round. 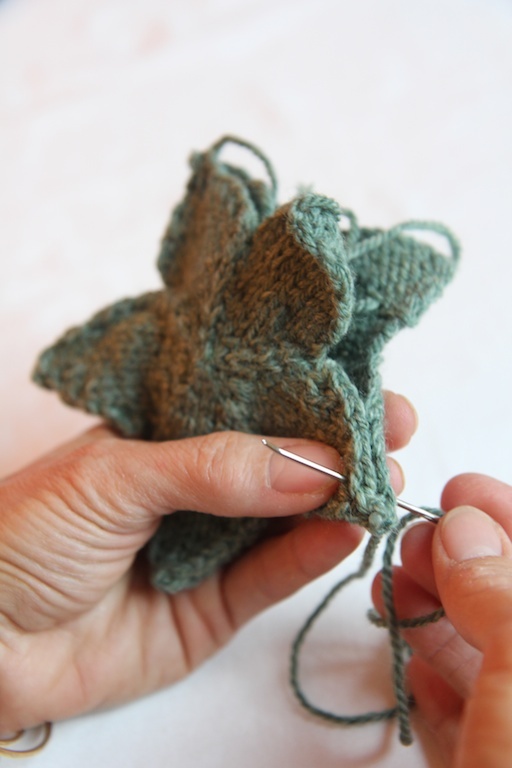 You increase stitches as you go around and then start knitting the points by using turns and decreasing stitches. After a few stars, I had the pattern memorized. the ends are used as stuffing, so no weaving in! One thing I liked about knitting these was there was no ends to weave in! I hate weaving in ends. You use the ends as stuffing. So if you want the stars to be plumper, leave longer ends. 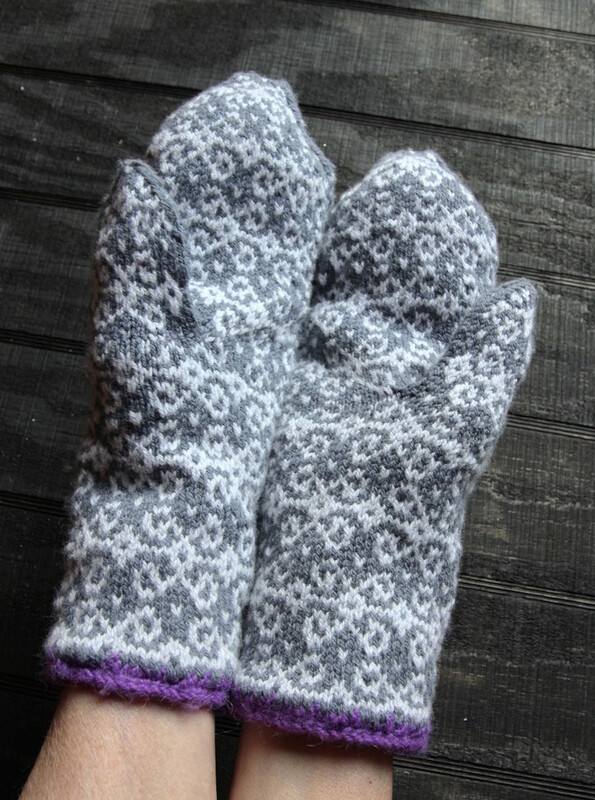 I knit these using Magic Loop, which made it so easy. No DPN tips to mess around with. 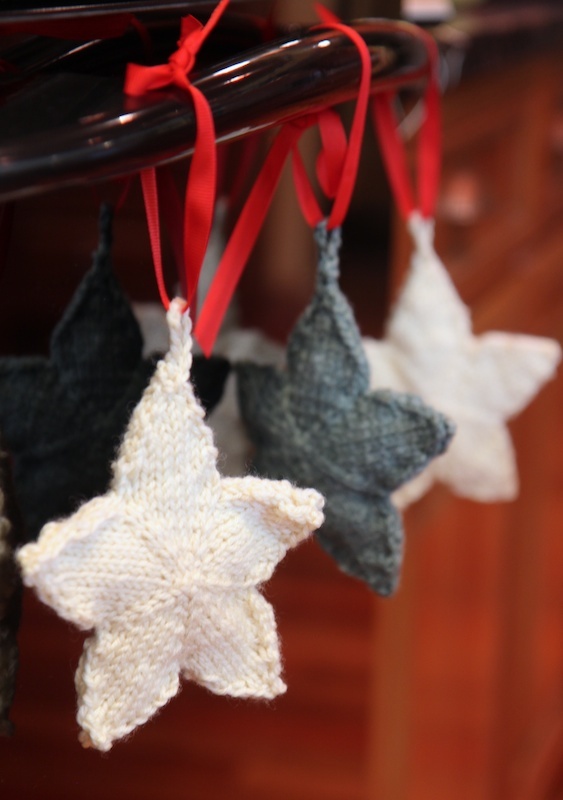 These were pretty fast to knit, also – one star from start to finish takes about an hour and a half. 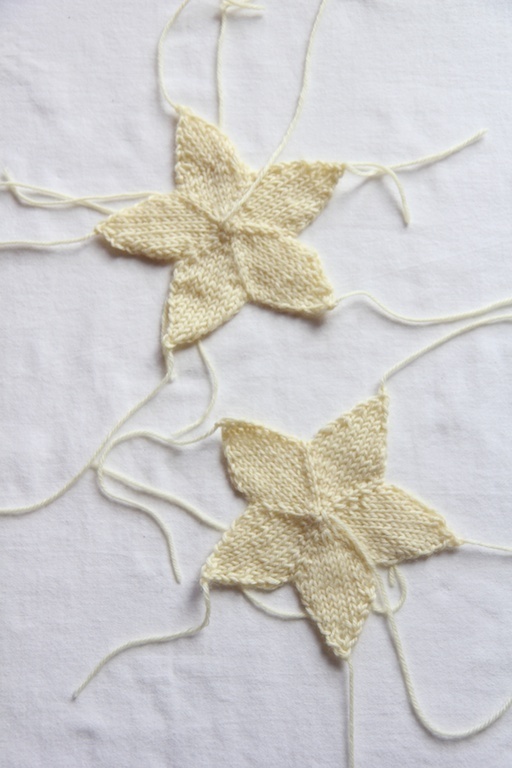 I gave the stars a little soak after I knit them and laid them flat on a towel to block. Then I sewed the two halves together, stuffing the ends in as I went. I crocheted a little loop at the top so I could hang them. Wouldn’t these be cute in pinks and reds for Valentine’s Day? I could even see knitting a bunch of them in a room’s colors and throwing them in a big bowl on a coffee table. So many possibilities.